Cool after molding, chocolate camels made with camel milk are transferred for packaging at Al Nassma in Dubai. I have a dark secret: I am not a great cook. I could live off cheese sandwiches, whole fruit and the occasional meat, forever. My mother doesn’t know this. So it should come as no surprise that I, a woman from Saudi Arabia, have never eaten camel meat. Or drank camel milk. And while I am, clearly, without shame, I am also curious. That is what brought me to the tent in al-Rumah, two hours from Riyadh, at the King Abdulaziz Camel Festival. I came knowing that, over the next few days, I’d be eating camel. It only took a few hours. The words come with much anticipation. Dinner, it turns out, was camel. They divided part of one camel among five enormous silver trays, each with rice and vegetables. “Do you eat camel often?” I ask my companions. “Not really,” Nada answers. “We have it when important guests visit us. And during Ramadan. We have to have it during Ramadan. “We’ll buy a whole camel and split it between our homes,” she says. One camel can feed several hundred people. She explains that the “most delicious” camel meat is hashi. That means it comes from a camel between six months and one year old. This is where Mohammed is mistaken. Before their meat ever filled anybody’s belly, camels were first and foremost a means of crossing and surviving in deserts. It’s a job they got by developing padded feet, protective long eyelashes and of course the ability to go weeks without water. Their hair and skins provide clothing and shelter, and even their pellet-like excrement—nearly odorless—can be burned to cook a meal. Not to mention the nutritious milk. They’re “ships of the desert” for good reasons. But that’s a role that seems to be changing. 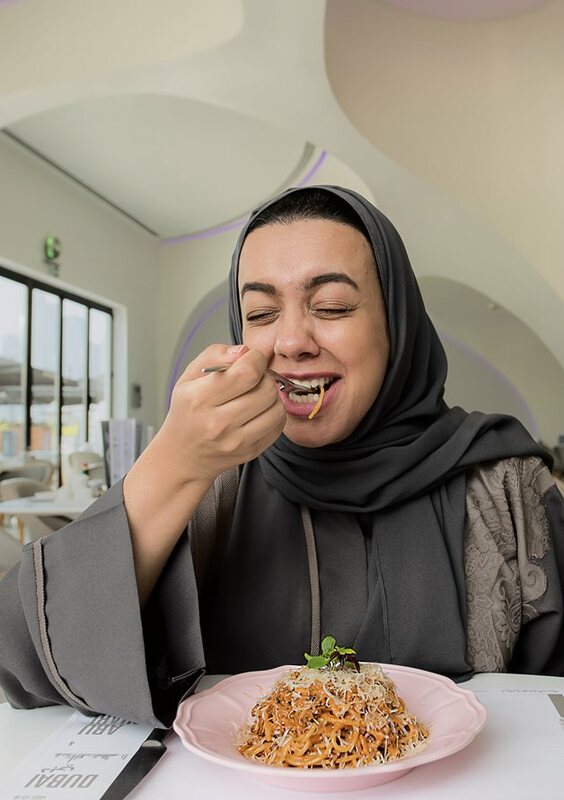 Camel sliders and fries go down with mango juice at Louvre Abu Dhabi café. Just add water to Camelicious’s camel milk powder. Wash and rinse with Camellure’s camel-milk shampoo. Desert begets dessert with date-flavored ice cream at Al Fanar in Abu Dhabi. Baby Camel Bites come with Cajun spices at CML Station, Abu Dhabi. Camel Cookies come by the can. Nouq camel milk ice cream comes in flavors that include pistachio and Arabic Mastic. The Camel Soap Factory’s signature scented soap bars sell briskly to tourists. Al Nassma’s gold-foil-wrapped camel milk chocolate comes in five flavors. Endurance Drink and milk by Camelicious. Baby Camel Salad at CML Station. The next day, I ask my colleagues if they’ve ever had camel meat or milk before. Three people, three very different impressions: Is camel milk a kind of tasting equivalent of a #TheDress debate? At the festival’s suq, I meet Umm Abdullah, an older woman who is selling camel bridles. I ask if she has ever eaten camel. She laughs. She refuses to share her recipe for camel meat. “You simply use the same spices that you would for lamb,” she says. “Everybody has their own favorite mix.” Instead, she shares her recipe for camel milk. Next door, Umm Muhammad is happy to share her camel meat recipe. “I only make camel meat with rice, like a kabsah. It doesn’t work otherwise,” she says. “I put cinnamon, dried lime, bay leaves, cloves and cardamom. But I don’t like camel. Farther down the suq, Umm Ziyad asks if I’m interested in spices. I ask if she has any for camel meat. Harees is a porridge-like dish, and it is a traditional recipe from Najd, Saudi Arabia’s central province. She directs me: Put the camel meat in until it is “half-cooked, or the fat melts a bit.” Then add harees (cracked wheat, or bulgur, would likely do). Add water. Boil. And just like that, she gives me her number. Trays of camel meat with rice make for traditional fare for owners, breeders and family members at the annual King Abdulaziz Camel Festival near Riyadh, Saudi Arabia. The meat of a single camel can feed up to several hundred people. Before refrigeration this meant that a camel would be slaughtered only for a major event. Back at the festival, Saeed al-Sowailem, M.D., gives me the rundown on the little-understood coronavirus, also known as the Middle East Respiratory Syndrome, or mers, that emerged in 2012 in Saudi Arabia. At its peak in 2015, it had claimed more than 500 lives. The virus was discovered to originate from bats, but camels, too, were carriers. This spread fears around camel milk and meat. Two brothers, Mohammed and Nawwaf al-Sahli, tell me there’s “no way” they would eat camel, and food safety has nothing to do with it. “I don’t like it,” says Mohammed, the older brother. “It’s tough. It has lots of bones. But I do like camel milk a lot. When I meet Fawzan al-Madi, he is between overseeing camel races and rounds in the camel beauty contests. What, I ask, does he look for in deciding whether a camel will be a money-winner or food? Al-Madi is on the board of the kingdom’s Camel Club, the newly formed official body that is gradually consolidating camel events in Saudi Arabia under one administrative umbrella and, with this effort, pushing camel culture to new heights. It may come as a surprise that Saudi Arabia, home to 1.4 million of the world’s dromedary (one-hump camel) population, does not derive more economic benefit from camel industries aside from untreated camel leather. There are not yet any major commercial camel farms, let alone any significant derivative products from camel meats or milk. Currently the most reliable source of camel meats and milk are local weekly markets, where farmers gather from neighboring towns and cities to sell their produce, or straight from camel markets. I’m pretty sure no camel ever actually said that. There are two burgers on the menu: hashi and chicken. I realize this is not the time for chicken. I get to the cashier and ask what they put in the hashi burger. I take my first bite. It’s tender. Juicy. Slight crunch. The spiciness of the rocket leaves is … interesting. Ultimately, it’s a burger. Not exactly a big deal. 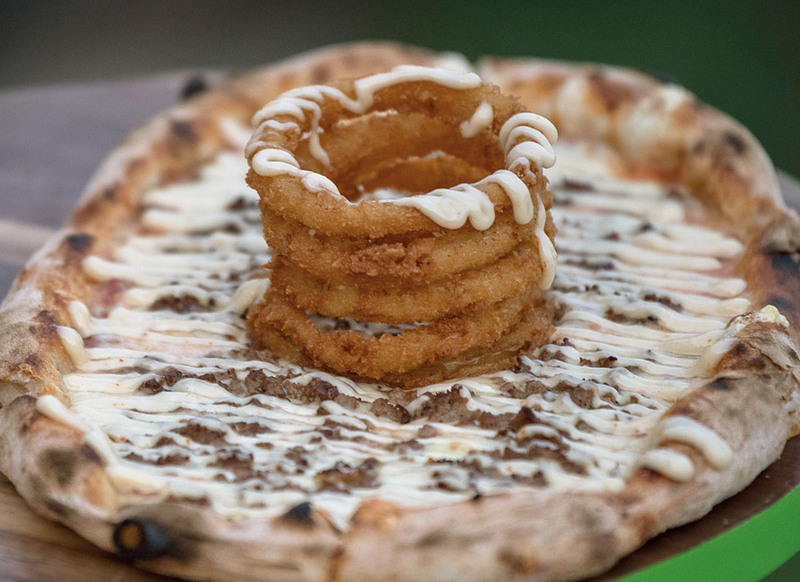 Baby Camel Pizza at CML Station. On the ride back to the hotel, I tell our Uber driver, Nasir, that I just had my first taste of hashi. Nasir, it turns out, has a lot to say about camel meat. “Did you know that the best part of the camel is not the hump, but right under the hump, where the fat from the hump has made the meat delicious and tender? “And don’t try eating the tongue either. It’s rough from eating all the spiky desert plants. It’s not like lamb. “Ah, I bet you didn’t know this either,” he goes on, glancing back through the rearview mirror, excited. And so it was that Nasir solved our camel milk mystery. Back home, I reflect on the people I have met. Many told stories of older relatives who have kept traditions of raising camels, drinking their milk and eating their meat, but these traditions rarely survive beyond that older generation. For many, a need to move to the city changes everything. My own departure from those customs happened several generations ago when my great-grandfather left his village and followed the trade route and settled abroad. My parents became the first generation of his descendants to return to Saudi Arabia. While there are many traditions we’ve held onto and passed on, there are some we lost. Chef Francis Mungai Njogu prepares minced camel meat for a Camel Bolognese at Switch, whose menu, below, offers several camel dishes. Searching for published camel recipes, or descriptions of their culinary context, I am fairly shocked to find a general dearth of both. Whether it is Arabic or English cookbooks, written by Arab authors or foreign visitors, the gap is glaring. The oldest “Saudi cookbook” I can find, The Art of Saudi Cooking, was published in 1987 by Al Nahda Women’s Charity Society. In it there’s mention of “passing on to our daughters ... our treasured, but soon-to-be-forgotten, local cuisine.” The book has a recipe for stuffed turkey, two for lamb’s brains, but not one for camel. Going back further—a lot further—there is A. J. Arberry’s translation of Kitab al-tabikh (Book of Cooking), a cookbook produced around 1226 by Baghdad scholar Shams al-din al-Baghdadi. It includes 164 recipes, and no camel. To help me understand this, I speak to chef and food writer Anissa Helou, who has written nine books. Her latest, Feast: Foods of the Islamic World, includes a chapter on her experiences with camel. There is a place, I learn, where al-Madi’s prediction of factories and camel-food products is happening. We fly an hour south and land in Abu Dhabi. 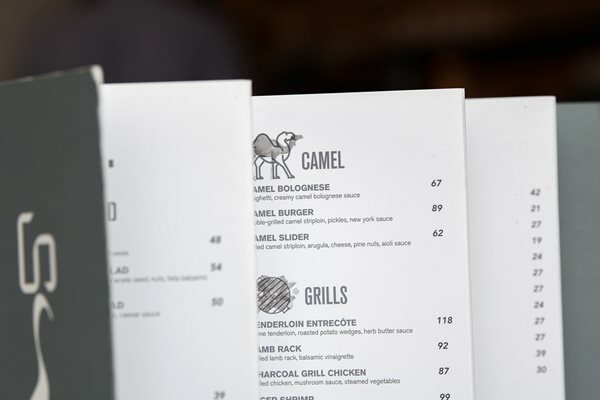 In the United Arab Emirates (uae) capital, we sit down at a hipster fusion restaurant called Switch where the menu includes a whole section titled “Camel.” Camel Slider, Camel Burger, even Camel Bolognese. We taste all three. With me are Hatim, a photographer, and Mariam, a fellow Saudi living in Abu Dhabi. Mariam admits she has never eaten camel. “Growing up, they told us that if you eat camel, your heart will become tough because the meat is tough,” she says. She takes a bite of the bolognese. Pause. Chew. Swallow. 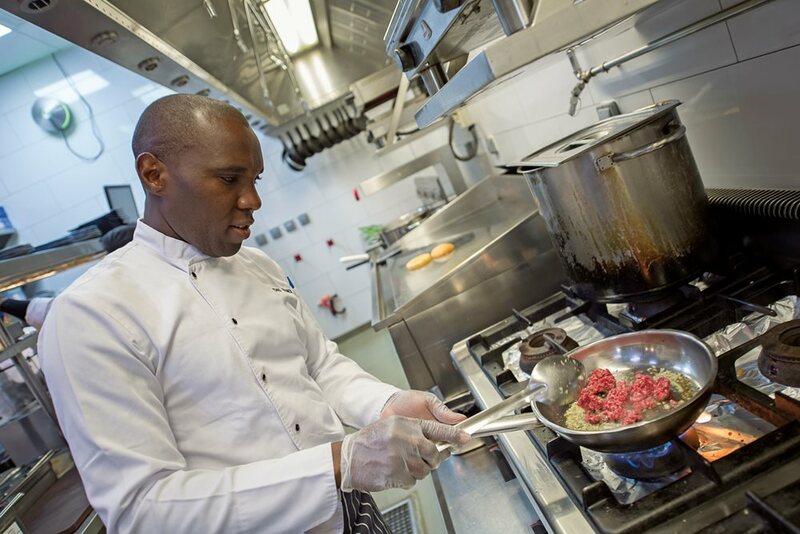 In the kitchen, Chef Francis Mungai Njogu says he had never cooked camel before he came to Switch, but he had grown up in Kenya drinking camel milk. Our next stop is CML Station, where the menu offers Baby Camel Salad, Baby Camel Cubes and Baby Camel Pizza. It takes me a moment to realize that this restaurant’s name is not an acronym. It opened last year, which makes it about as old—or young—as some of the hashi it dishes up. Habib, general manager of operations for owner Murban Restaurant Management, says it’s one of the several food and beverage brands they manage, including Camel Cookies, which opened four years ago. Our meal arrives, and the standout favorite is baby camel cubes. The smaller cuts are perfectly tender, paired with potato spirals and some very un-local Cajun spice. “Ours is a modern twist of a national symbol and product,” says Habib. At the Camelicious dairy farm in Dubai, camels are carefully trained to accept automatic milking. Their milk is pasteurized and bottled in a variety of flavors including date, chocolate and strawberry. It was time for milk. One of the two major camel dairy farms in the uae, Camelicious, lies on the outskirts of Dubai. 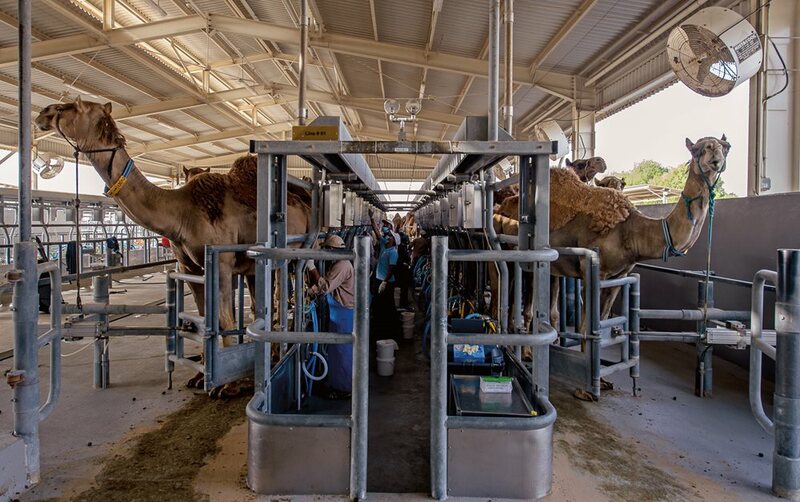 We arrive as camels are lining up, entering a pen, and workers are attaching automated milkers. “The innovation of automated camel milkers happened here,” says Karim, Camelicious’s representative, who points out that each milking session lasts about five minutes and yields five to seven liters. The farm started in 2003 with 16 camels, he says. Now it has more than 6,000. Karim, it turns out, is something of an evangelist for his product. Milking camels is also far more nuanced than milking cows. Camels produce milk for 14 to 18 months after delivering a calf but—this is the tricky part—they let down milk only to their calves, and if they are separated, they stop lactating. A few weeks after birth, the farm workers start training the mothers by making sure the calves nurse only in the milking pens. There, they develop an association of the handler’s “tongue-clicks” with nursing. Then—gradually—the automated milkers can be used on them. Another key is well-being: an unhappy camel won’t produce milk. So the mothers and calves exercise daily along a track. It’s a bit like roaming the desert. Sort of. Hungry attendees line up at “The Truck” for camel burgers (with french fries, of course) at the King Abdulaziz Camel Festival. Camelicious has gone well beyond simple bottled whole and skimmed milk: There are flavors, powdered milk, ice cream and even baby formula. The baby formula, he says, works well for children with allergies to cow milk products. Then there is Endurance, a new energy drink. “Camel milk has all the necessary vitamins for athletes. It’s a healthy alternative to sugary energy drinks,” he says. A protein bar is in the works. I ask him why this hasn’t happened earlier. But converted they were. The company now produces 3.6 million liters of camel milk a year, and most goes down locally among Emiratis, Europeans and Asians alike. It was time for dessert. That started with ice cream. Stephan Barbier, who came to the uae from France, believes the world would be a better place with more camel milk ice cream. They started Nouq—from the Arabic for a she-camel—in 2016. Their flavors range from staple vanilla and chocolate to “crossovers” common in Europe and the Middle East, such as pistachio and caramel biscuit, as well as niche flavors known only in the Middle East, such as Arabic Mastic. I try their most popular flavor, Honey Saffron, which is aimed at Emiratis and Indians, as well as Europeans. It’s sweeter than I expect. Camel Cookies, which makes cookies with regional flavors but not camel milk, is riding a camel-conscious wave of popularity. The Majlis is a café in Dubai Mall where, if it’s not made with camel milk, it’s prepared in camel ghee. Seated nearby are Silas and Mateus, from Brazil. It’s their first time to taste camel milk. Mateus orders a cappuccino. “Do you taste the sand?” Silas teases as his friend sips. I can not leave before paying a visit to the camel milk chocolate factory. I repeat: Camel milk. Chocolate. Factory. I leave with a bag full of camel milk chocolates. Everything finishes better that way. Martin Van Almsick spent the first part of his life working in the chocolate industry in his hometown of Köln, Germany. His wife, Hanan, comes from Sudan—“camel country,” he says—and was familiar with the milk. So in 2005 when the pair heard a camel milk factory had opened in Dubai, it was a no-brainer: Al Nassma Camel Milk Chocolates was born a few years later. Their first challenge was a recipe that would work with camel milk’s lower fat and higher salt. But their bigger challenge was cost, because camel milk is so much more expensive than cow milk. “Camel Milk 101” starts best with coffee or tea—and don’t worry if you don’t get it right the first time. My own favorite flavor? So far it’s Arabia. It pairs great with the milk, and it tastes like … home. As for camels? I’ve become too attached to eat them anymore. 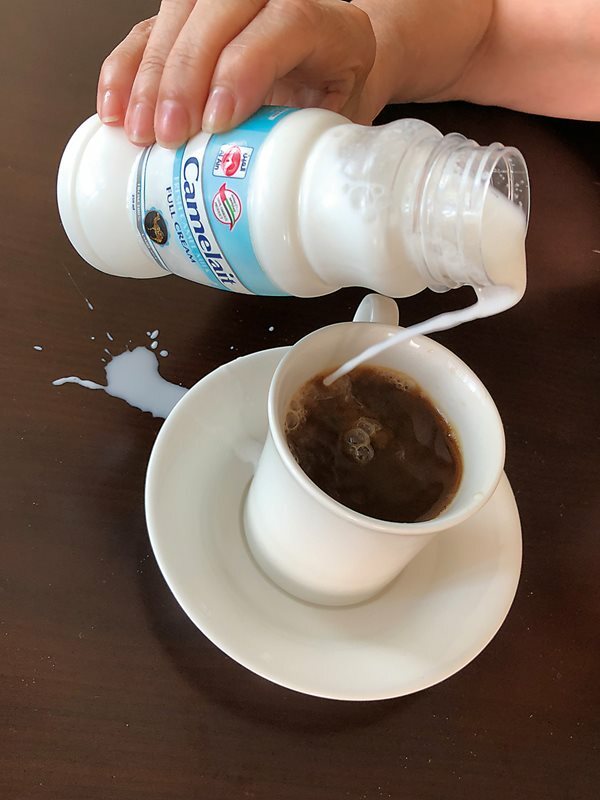 But the milk? I’m a proper convert. Sara Al-Bassam is a writer, researcher, startup consultant and new fan of camels. She lives in al-Khobar, Saudi Arabia.